This extension allow you to add tracking number in your order. 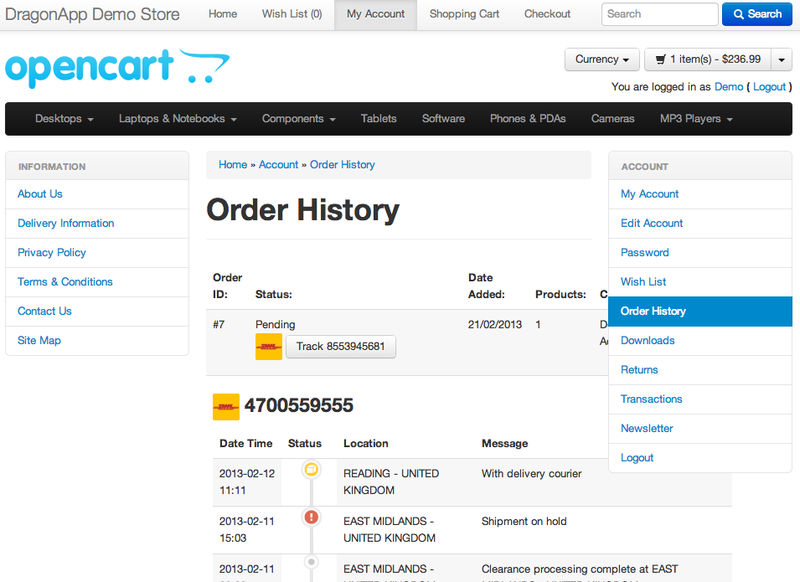 You can add unlimited tracking numbers per order. Customer will also get the email about the tracking info. service, you can also track all your shipment in one place at their site. Each order can have more than one tracking number. This extension DO NOT overwrite any file. Simply upload the files in upload folder to your public root folder. There are TWO themes files related, only upload the file if you need. Go to Modules --> DragonApp Track Shipment Click Install, enable the couriers that you want to be included. In your Orders --> View --> History When you update the order history, you will able to input the tracking number and selected the couriers. The update email will included the tracking link to your customer directly. 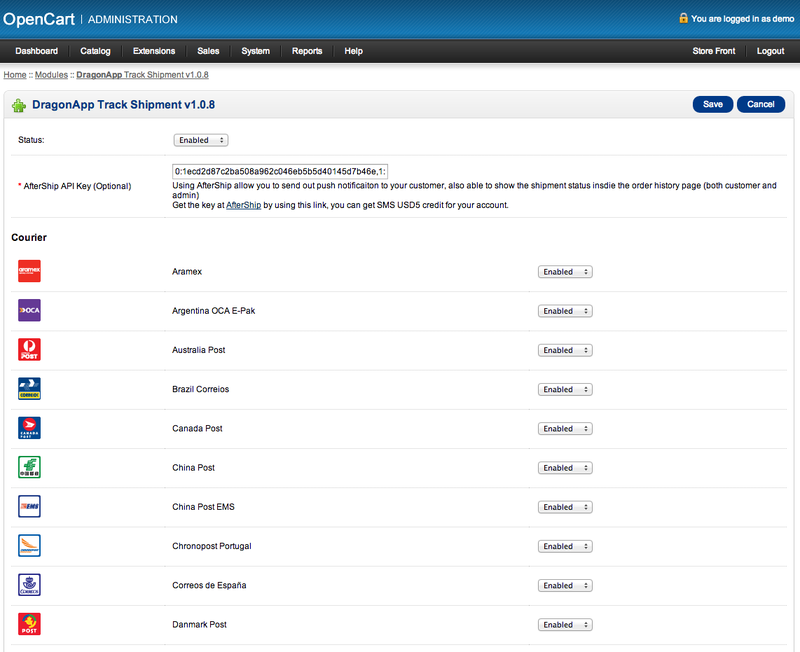 If you have AfterShip API key, you will able to see all the track point message directly in your admin panel. If you have multi store and want to use different API key for each store. Follow the instruction to upgrade or do installation. After installation, REMOVE the da_install folder and da_install_track.php files. Enable the couriers that you want to be included. 1. What is the "AfterShip API Key"? AfterShip is an online service which help you to TRACK and NOTIFY your customer after the package is shipped. 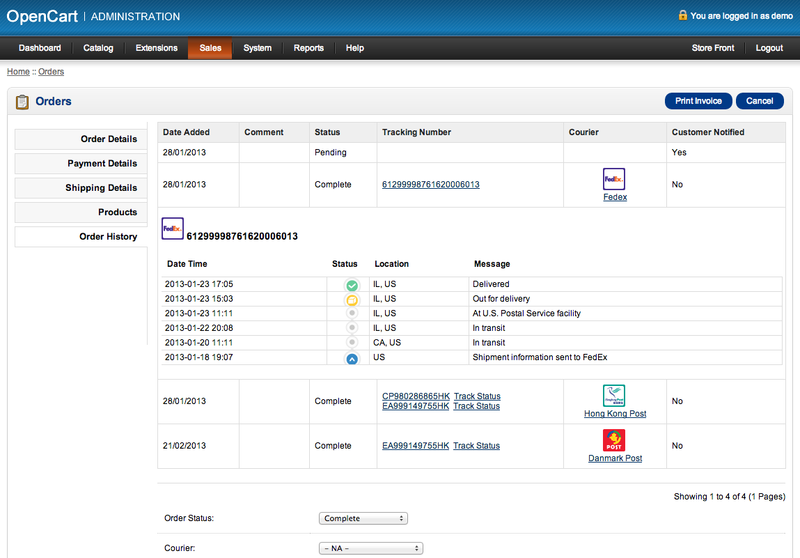 It is very useful as you can monitor ALL the shipments in one place. It is an optional features, you may leave the API key field blank to disable it. But we strongly suggest to try it, as it is FREE of charge for first 30 days. 2. Which couriers do you support? Added more couriers, now support over 220 couriers! Added more couriers, now support 192 couriers! Fix the installation error, sorry for the problem caused! Added more couriers and now support 150! Added more couriers and now support 134! Added more couriers and now support 127! Added courier up to over 120! Will send out the tracking information in backend if the tracking number is saved. Remove the install script now no more manual install step! All automatically. Then simply go to backend --> modules --> uninstall, then install again. Remove the g.tt link, as they no longer support. Fix the courier images, such as "mrw-spain"
No Aftership API is needed, you can still track within your site without leaving your site. Add new couriers, now support total 77 couriers! Updated AfterShip API to version 2. Fix undefined variable "courier_id", "slug"